Two States is a lighthearted look at the world of Indie and Alternative music. 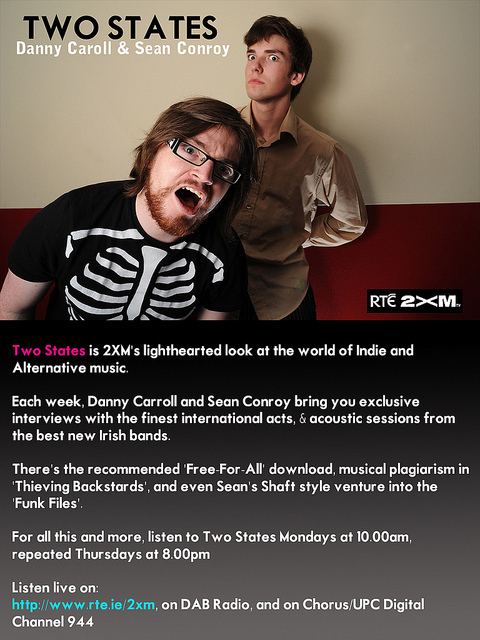 Each week Danny Carroll and Sean Conroy bring you exclusive interviews with the finest international acts, & acoustic sessions from the best new Irish bands. There’s the recommended ‘Free-For-All’ download, musical plagiarism in ‘Thieving Backstards’, and even Sean’s Shaft style venture into the ‘Funk Files’. Here onsite, you’ll find exclusive tracks, photos from the sessions and hi-larious out-takes. …Along with some more inane banter! …It is the internet, after all.